Have you ever asked yourself why it is not possible to use external text editors instead of the editor that is offered on a website or in a program? There are numerous reasons why someone would want to use an external editor, with the most popular reasons being limitations in size and editing functionality. Just compare a plain web comment box with a feature rich editor like Emacs or BBCeditor. These editors offer features such as macros, better previewing, auto completion, spell checking, syntax highlighting and searching and a lot more, that many web editors do not offer at all. Plus, their windows can be resized easily. We have reviewed several web browser extensions in the past that add that functionality to a browser. It's all text for Firefox allows you for instance to edit text in an external editor, while Form Text Resizer can resize web forms in multiple browsers. But those extensions and tools are often limited to one web browser. What if you use multiple browsers or other programs like the email clients Thunderbird or Outlook? Text Editor Anywhere is the answer to that question. 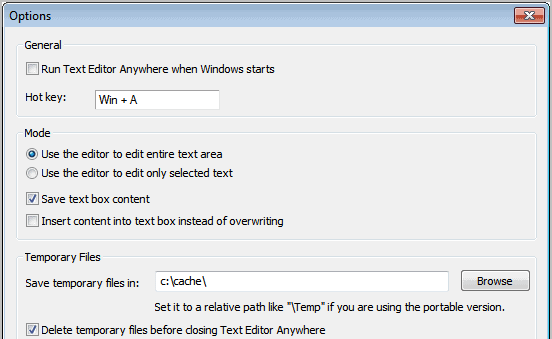 The free software for Windows can be used to edit text anywhere in external text editors. The program is offered as a portable version and installer. Its functionality becomes available once it is started. Just press the Windows-a hotkey when you have a window open with a text editor to select an external editor in the list of available text editors. The selection menu displays the default editor on first start. It is possible to add additional editors to the list to make their selection easier in the future. The text editor can be selected with a mouse click or the cursor and enter keys. 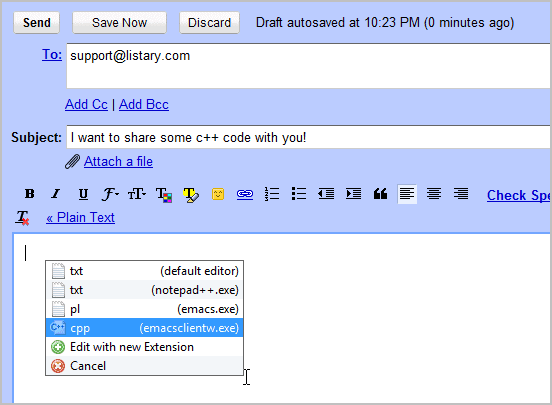 All text will be copied and pasted automatically in the selected text editor. 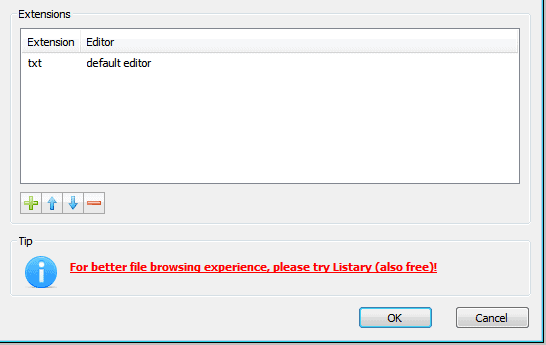 The edited text is then automatically transferred back to the original form once the external text editor is closed. A right-click on the program icon in the Windows System Tray displays options to change the hot key that triggers the editor selection menu, the temporary file path on the system and all configured text editors available for selection. The program was not compatible with all text editors that I tried. It did not work with the system's default text editor Notepad++ for instance, but did work with the Windows text editor Notepad. It does not support Japanese, Chinese, Vietnamese language, with text like “シ ョ ッ ピ ン グ â ă ấ ô ơ” it shows just “?” character, maybe it will have some problem with Russian. Really need more improve. Hi Martin, newest version 2.01 supported Unicode, so cool. Now this software is almost perfect!